The TARDIS breaks down in a forbidden sector of space. Ghostly voices cry out for salvation and only C’rizz, the Doctor’s Eutermesan companion, can answer their call – for only he knows the secret of the Absolver. But will he use it to rescue his friends or save the universe? The Doctor’s sins are catching up with him and the infernal beast Borarus is hungry. Time is running out and Judgement Day is at hand. 1. The remission of sins granted by a chosen emancipator of the Church of the Foundation. 2. An emancipator handpicked from the Eutermesan masses and rewarded for obedience and total devotion. 3. One governed by the laws of a timeless universe to which, should he ever leave it, he may never ever return. 4. Out here, amongst these wandering souls – souls who call to me and beg me to join them – those laws no longer apply. 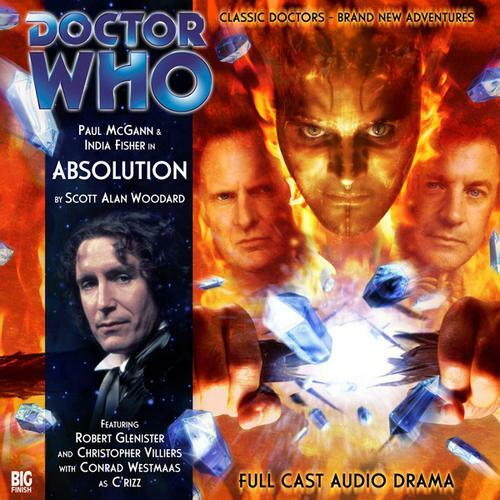 Absolution is a story that sees the death of C’rizz and the beginning of the end of Charley’s travels with the Eighth Doctor. This story is meant to be the big, epic swan song for the Eutermesan from the Divergent Universe, and indeed Absolution drips with a big-picture feel – lavish sets, huge special effects, big battles, interesting set pieces, and a world-spanning climax. 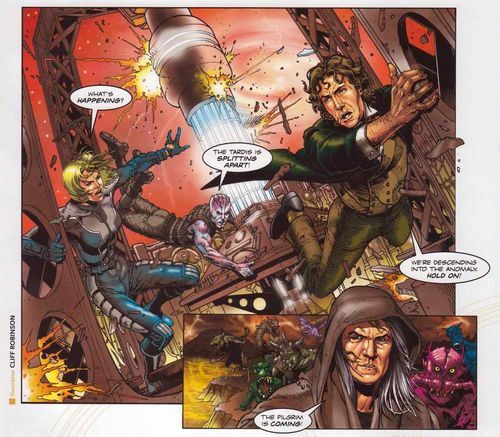 But just because something is “epic” doesn’t necessarily make it good, as C’rizz’s last story sees him shunted to the side for Jedi-like training while Eight and Charley show just how good their chemistry is even after all these years. The voices in C’rizz’s head have called out to him ever since their “salvation,” but a new voice cries out for his help to save the souls of a battered and dying world. Events are set in motion when Charley, visiting C’rizz in his room, picks up one of his religious icons that he refers to as an “Absolver.” When Charley opens it just to take a peek inside, all Hell breaks loose. It also doesn’t help that the plot itself is never really…well, absolved. The actions of the characters lead to the climax, but once the proverbial button is pushed…no one ever follows up on it. Are the people of the planet doomed? Saved? Did they merge with the demons? Is everything back to normal beyond the sun shining through once again? I understand that Absolution is C’rizz’s story, but even once his sacrifice saves the day, there’s no denouement regarding the secondary cast and what ever happens to them. It’s very jarring and makes the Eighth Doctor’s cheer about things (we’ll touch upon that in a bit) even more out of place. The secondary cast stands out among the rest of the story, with Robert Glenister (known for Spooks, Only Fools and Horses, Law and Order: UK, and a little thing called The Caves of Androzani) chewing the HELL out of the scenery as demonic warlock Aboresh. Glenister hits the right amount of over-the-top acting – imagine Emperor Palpatine training Luke Skywalker to be a Dark Jedi before turning him loose on an unsuspecting galaxy and you’ve got Aboresh. He’s charming but ruthless, friendly to C’rizz as he slowly trains him to do evil things. His moment of triumph is just as loud, proud, and bombastic as one would expect. Hugh Fitzwilliam ([bThe King’s Daemons and Professor Moorhouse in Mummy on the Orient Express) plays the other side as High Priest Cacothis, leader of the Citadel, and he’s just as over-the-top as the holy leader who damns blasphemers and will do whatever it takes to keep his flock safe, whether they like it or not. Lolanthia, played by Hotel Babylon’s Natalie Mendoza, is fine in her turn as Cacothis’ daughter who is determined to end the eons-long darkness and save her planet with a dedication that’s as firm as her father’s, just slightly less loud. Veterans actors Geoff Breton and Tony Barton deserve a shout-out as the guards who find themselves on the ramparts during the demonic siege and have a moment or two of nice banter and camaraderie between them. Absolution is C’rizz’s final story, and I can safely say that it’s…dramatic. But once again, the C’rizz we get in this story has very little narrative ties to any of the other C’rizz’s we’ve seen in previous stories. Now, to be fair, C’rizz has been fourteen stories over forty-six months, so that’s a C’rizz story every three-and-a-half months. Even if you take out the eight stories from the Divergent Universe’s arc with occurred in two segments of four, he’s been in seven stories over twenty-six months, or a story every three-and-three-quarters months. So there hasn’t been a long period of time where C’rizz has just fallen by the wayside. But without a firm, constant characterization over those seven stories, beginnig at the end of Terror Firma where listeners discover just how C’rizz is saving the souls he’s “absolved,” you could have had a C’rizz story EVERY MONTH and still been unable to get emotionally invested into C’rizz. Compare this to Hex, who has been in seven stories over forty months (or five-and-three-quarters months) and has vastly more characterization and emotional investment. I don’t blame this on Conrad Westmaas, I blame it on the writers and Gary Russell. It doesn’t seem like there was a firm hand on just how C’rizz was suppose to evolve as a character, which meant every writer was free to imprint their own thoughts and actions upon him. As such, his defining traits were inconsistent from story to story, such as his manner of forgiveness and the vicious nature (see the end of Other Lives) unseen by Charley and the Doctor. Don’t give me seven developed once or twice. Give me two traits developed seven times. With Absolution, Westmaas dives head-first into the concept of being the apprentice to Aboresh, who shows C’rizz how to control minds, levitate boulders, cause mental anguish in his victims, and finally evolve into a huge demon type (visions of Tim Curry in Legend come to mind) to fulfill his destiny as the absolver of souls. If this had been the end of a long, hard dark path of temptation and possible redemption for C’rizz, then this would have been a great send-off. What we get however is a case of “oh, you’re the chosen one because you can sense souls,” which I can buy, but it leads into “you’re a Jedi, C’rizz,” which comes out of NOWHERE (not even a mention of “this planet boots your natural abilities” or some technobabble). So here’s C’rizz going full Dark Side (because according to the Doctor, he’s a biological reliquary meant to keep the souls of his race stored until immortality could be achieved), but it comes out of the blue (like C’rizz being a biological reliquary, where the hell did THAT come from?) and feels incredibly detached from the rest of the story…much like C’rizz himself, who doesn’t intereact with anyone but Aboresh for most of Absolution’s runtime. He talks to Charley a few times, pleads with the Doctor for help even as he mentally assaults the guards trying to arrest the Time Lord, and by the time C’rizz has embraced his evolution and confronts the Doctor with promises of salvation through absorbing his life essence, it’s just…it’s dramatic, but it doesn’t mean anything. It’s the end of a Michael Bay movie not named The Rock or Bad Boys, where the villain is huge, powerful, threatening to kill our heroes, but there hasn’t been any real build-up other than snarling and stuff blowing up. Even C’rizz’s death scene is just…it’s acted well, but the sacrifice comes from C’rizz just flipping his personality – one moment, he’s a big scary devil out to absorb the Doctor, Charley, and then all the souls he can get his hands on, but then there’s a loud noise and he’s a Eutermesan again whose body is breaking down on a molecular level, with just enough time to tell Charley “good bye” before he’s just…gone. What makes Absolution a bit of an odd bird is that, for C’rizz’s farewell story, it’s the Doctor and Charley who shine. Paul McGann and India Fisher have always had come absolute fantastic chemistry, and being trapped in the Citadel and trying to unravel its mysteries show just how well Eight and Charley click. It’s not just their banter back-and-forth, but how well they complement each other – it’s Charley who notices the lack of dust on a control panel during a key scene – and how well they compliment each other – Eight’s pride in her keen eye to detail. I really hate to say it, but C’rizz has just always felt like a third wheel to the original pairing. The behind-the-scenes features for Absolution have a moment where Big Finish admit that C’rizz was brought in to defuse the romantic tension between Charley and the Doctor, and while the character may have succeeded in that regard, he never seemed to go beyond that point. The only real Doctor/C’rizz interaction that stands out to me during their time together was the interrogation scene from Something Inside and that was when the Doctor had amnesia! But there have been plenty of Doctor/Charley interactions I could name from their time together, including Eight and Charley solving the mystery of the Citadel together. They might not be huge, universe shattering moments, but I CAN remember them. With the end of C’rizz’s time in the TARDIS, it’s very easy to sum up his time with the Doctor and Charley with one simple picture. Conrad Westmaas did a great job with what he was given, but what he was given varied from one story to the next. Listeners never really got anything more of a basic sense of just who C’rizz. And in a scene that could come off a bit as Big Finish making their opinion known, after C’rizz has died, the Doctor is back in the TARDIS, a smile on his face as he asks Charley where she would like to go next. Charley is in shock, nearly in tears as she sees the Doctor not caring about what just happened, flat out yelling that the Doctor never cared for C’rizz and was happy that things were “back to normal” with him gone. The Doctor tries to explain how he feels, but he stammers and haws. For the first time I can remember, the Eighth Doctor is at a loss for words. Listeners know how he feels – that he is indeed hurt, and he’s trying to hide his sorrow behind a false front. But Charley, experiencing death on a personal basis for the first time in a long time – not the death of a universe, not the death of people she’s just met, not even her own death – reacts how a human would react, demanding the Doctor show how he feels. And the Doctor reacts how he would. That’s what it boils down to. C’rizz’s time in the TARDIS was done, and maybe the Eighth Doctor never quite felt right with an alien companion. We know each death affects him, each life incredibly precious to him. Maybe the Doctor was just trying to keep the British end up for Charlie’s sake. Maybe this is just how this incarnation deals with death (something we will see a LOT more of as Eight’s story unfolds). But in any case, the scene between Charley and the Doctor, no matter how much fans might sense Big Finish’s opinion in their words, is absolutely heartbreaking, as it ends with Charley telling the Doctor to take her home. It doesn’t matter that “home” is the R101 over the skies of France before it explodes. She’s done. She’s had enough. 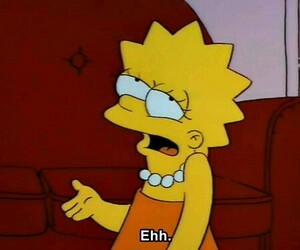 – C’rizz death scene just…didn’t do anything for me. Cobi’s Synopsis – C’rizz’s final story, Absolution is dramatic but without substance as the the focus is more on Charley and the Doctor than the departing Eutermesan. This entry was posted in Big Finish Review and tagged Big Finish, Big Finish Audio, Big Finish Review, C'rizz, Charley Pollard, Conrad Westmaas, Doctor Who, Doctor Who Audio, Doctor Who Review, Eighth Doctor, India Fisher, paul mcgann. Bookmark the permalink.